Yes, I know. Falafel are vegetarian anyway. However, my thought process went like this: falafel tastes really yummy with hummus. But hummus and falafel are both chickpea-based. Who wants to eat chickpeas with a side of chickpeas? BORING. And clearly, hummus wins. Because, HUMMUS! 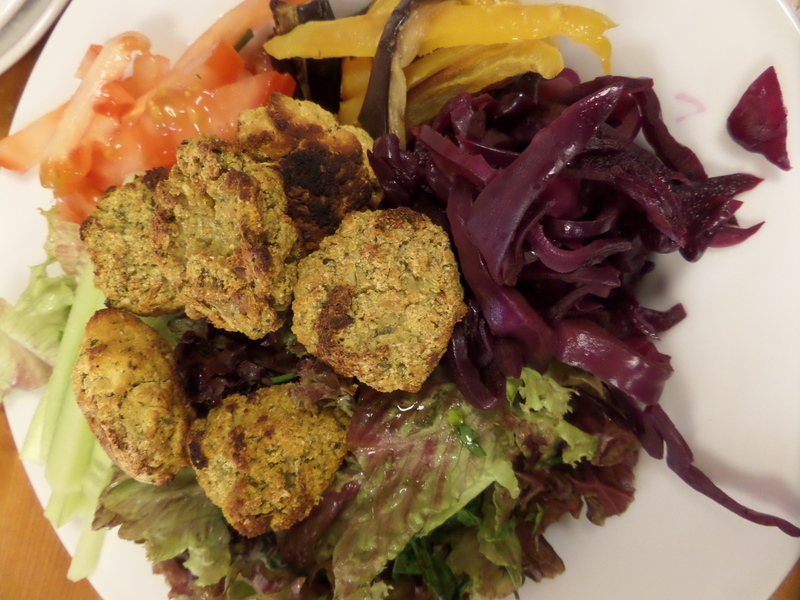 So…what to make the falafel from? My solution? A mixture of cauliflower and courgette. I minced 1 head of cauliflower with 2 baby courgettes, an onion, some garlic, and herbs: fresh parsley and coriander. I also added some lemon zest, and dried oregano, cumin and an egg. To help the mixture bind together slightly better, I added equal parts coconut flour and arrowroot powder gradually, until the mixture was more malleable. 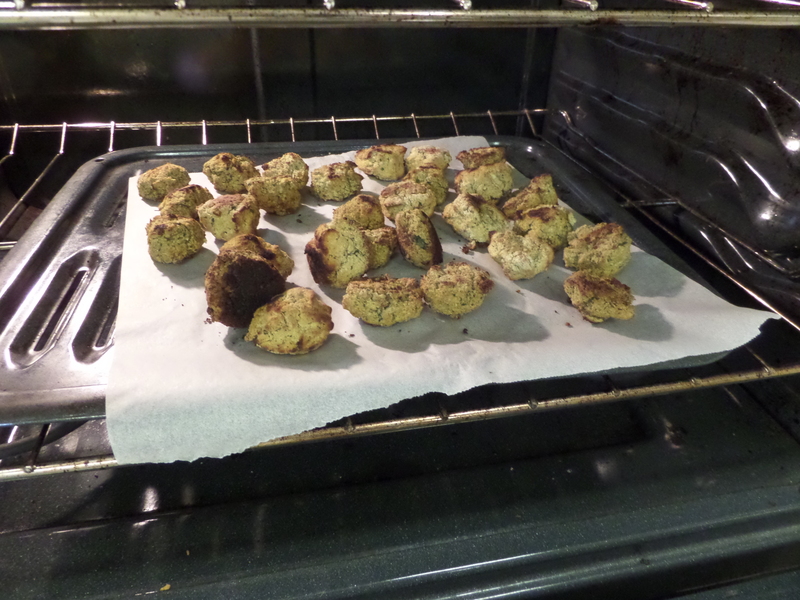 After forming them into balls (it made about 30), I baked them at 375 F for about 30 minutes, before turning them over and baking for another 30 minutes. I was really worried they wouldn’t crisp up, but they did in the end! I had mine as a salad, with hummus, home-made chili and garlic sauces, pickled red cabbage, and a chopped salad with fresh mint, coriander and parsley. 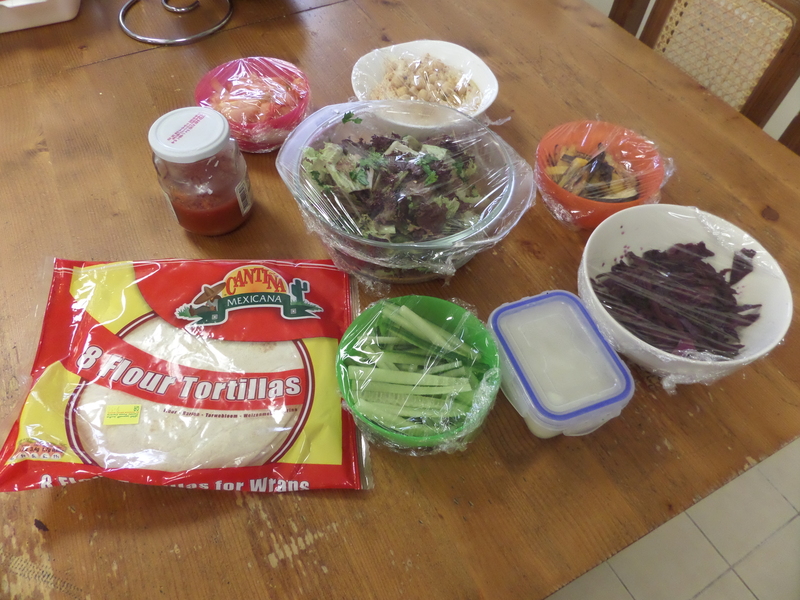 We also had fresh tomato and cucumber, and roasted peppers and eggplant. My family had them in wraps. Posted in lunchTagged cauliflower, coriander, courgette, parsleyBookmark the permalink.